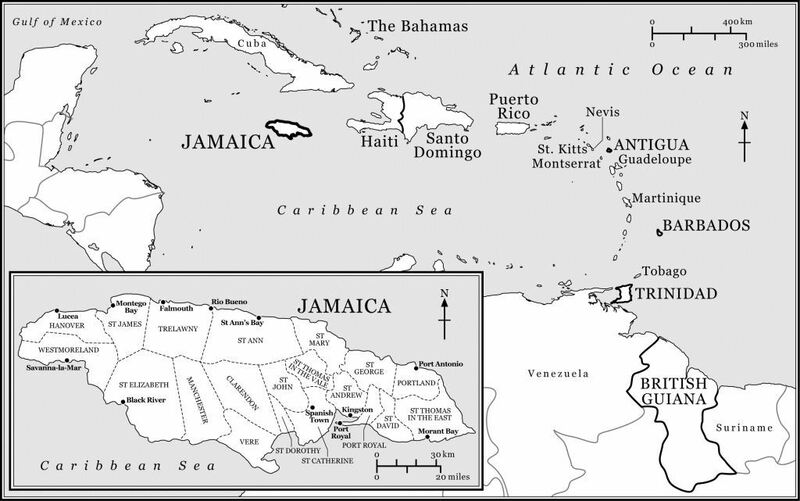 Jamaica is the third largest island in the Greater Antilles. It is about 140 miles long, east to west, and about fifty miles across at its widest point. It contains forested areas and some high mountain ranges in the interior. Its river valleys and coastal region are characterised by flat and fertile land, ideal for growing sugar. Jamaica was inhabited by Native American people, known as Tainos, at the point when Christopher Columbus made landfall there in 1494. It remained a Spanish colony until seized by the English in 1655. By the middle of the eighteenth century, the island was of central significance to the British empire, which at that time was primarily an Atlantic empire, with significant colonies on the North American mainland and in the Caribbean. Jamaica was important to Britain because of its production of sugar, which was the leading commodity imported into Britain at the time. Before the American Revolutionary War, which began in 1775, the most heavily populated and geographically extensive colonies in the British-American empire were those of North America between New England and Georgia. The most economically and strategically significant part of the empire, however, were the Caribbean colonies, including Jamaica, Antigua, St Kitts, Nevis, and Barbados. All of these British-American colonies were part of a wider Atlantic system of trade, migration, and exploitation, which connected the British Isles with Western Africa and the Americas. At the end of the American Revolutionary War, in 1783, Britain had lost thirteen of its mainland colonies, which became the United States. However, the territories in the Caribbean were retained within the empire. Like the other British-Caribbean colonies, Jamaica was a slave society. Enslaved people, imported to the region from West Africa via the transatlantic slave trade made up the majority of the population. These people were victims of a brutal and oppressive regime, which exploited their labour in pursuit of profit. Enslaved people were bought and sold as property and most of them were put to work on plantations, such as the sugar plantations of Jamaica.